I have enjoyed my time off from work during this holiday. As often happens, your expected relaxation period fritters away in a host of activities you had not even planned. Until the new year, we spent most days making a 200 mile round trip to Bruno’s trainer. All very worthwhile, but it did little to relieve my angst over my daily commute to work. Seems like most days found us headed up the highway, with or without some horses in the trailer behind us. When we got home, there were barn chores to do, Feather and the other horses to ride. I got to my mom’s every day and enjoyed some less hurried time with her. She loves her new pink warm-up suits (it is not clear what she is warming up to do but anyway she likes them) that she got for Christmas. I was under the illusion that maybe Bruno might be ready to make his debut at the show this weekend, but I was clearly told, save your money, while he is vastly improved he is not yet show worthy. At the last moment, we sent in the entry form for Feather to go. A year ago, we headed into one of the lowest height divisions with Feather. Now, she was deemed ready to enter the highest height division of our schooling show association, Open Jumper, with fences to 3’6″. Mickey in his prime, had won seasonal titles in this height division a few times over but it took Lauren years of work to get there. Feather headed into the ring yesterday, the last horse to show, in the last division of the day. Lauren professed to be cool as a cucumber. As my videos will attest, my hands were shaking, my heart was thumping, and my brain was on a constant prayer loop of “God, let them be safe, let them be safe”. I looked down in the ring to where the jumps had just been re-set to the new height and wondered what we were thinking. This little (not even 16 hand) mare was not ready for this. Little did I know that back in the warm-up ring Feather had just eased over a four-foot oxer. Dev doesn’t tell Lauren how big the jumps are until Feather clears them. 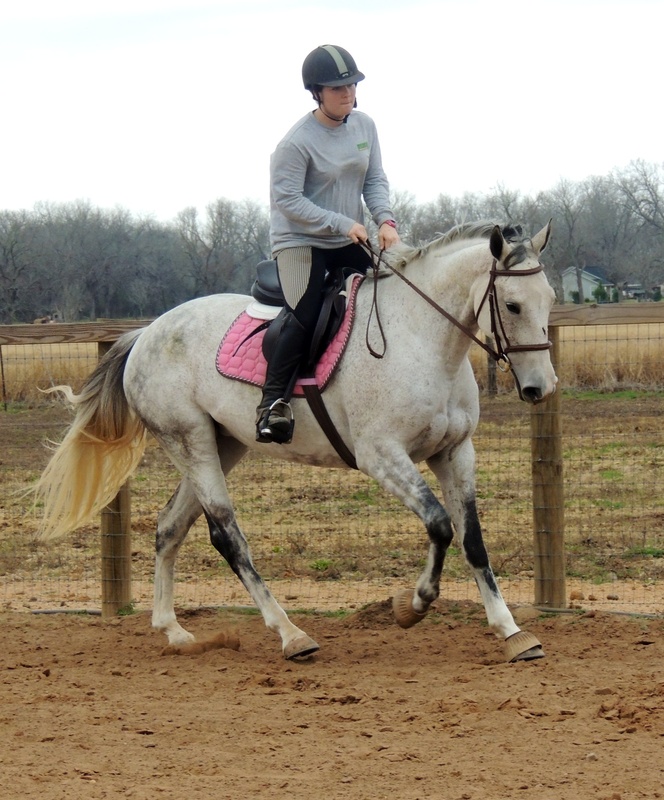 Lauren came in like a pro but more amazing was the calm, confident horse she was riding. The same one who, just the other day, had broken the cross ties, rearing when I tried to trim the hair on her legs. Maybe she just hates me, a possibility, or maybe some magical genetic code deep in her breeding, knows when she steps in the show ring, turning on her show horse persona. This is the video from their first round in Open Jumpers. They were second fastest. But I like seeing just how quiet and business like they both are. And clearly, we still have not gotten close to the top end of what this mare can jump. So, a new year ahead, great new opportunities for Feather and Bruno. What I would have given to have known this part of the story last year as we struggled along. But I do understand and appreciate that our joy is greater for having had the struggle and the unknown as we came through 2013. I only dreamed that Bruno would be fit to ride and Feather actually loading in a trailer to go a show. How far we have come! And I think this coming year will be one where we take a lot of new first steps. After all, 2014 is the year of the horse! Our first weather challenge of the year is upon us with temperatures below freezing for several hours, off and on, the next couple of days. As a preemptive strike against all my pipes freezing and breaking as they did several years ago, tonight before bed, we turn off our water well. All pipes will be drained. An empty pipe does not freeze. We will be without water until the temperatures come back up above freezing. I should be looking top-notch to head back to work. As the temperatures start to plummet and the north wind soars, I am filling troughs to the brim, setting two full buckets in each stall and preparing for a farm with no water. And yes, the pipes are wrapped, and no, running water all night does not work except to overflow my septic system. The house and its plumbing are too old and we are just too exposed to the cold on this plot of land. Thank you for riding along, pray for warmer temperatures for all and be safe! This entry was posted in Horses, The horses of Six Meadow Farm and tagged Developing the sport horse, retraining OTTBs by Exechorseluver. Bookmark the permalink. They look great! Feather has got so much bounce in her jump, it’s really cute!